Designed for outdoor, rough environments, the Industrial Dipole Outdoor Antenna is constructed to survive in extreme temperature ranges and under harsh UV conditions. It is tested and certified for IP67 exposure using UL (f1) compatible materials. 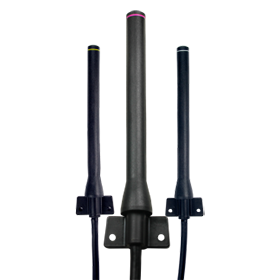 This robust antenna is an integrated solution, combining both cable and antenna into a single unit, resulting in up to 20% better efficiency than a traditional solution using a separate cable and antenna. Higher efficiency means more radiated power and longer-range operation. Higher efficiency means more radiated power and longer-range operation. An integrated mounting bracket simplifies installation, shortening installation time and lowering costs. Available in 868 MHz, 916 MHz and 2.4 GHz, the Industrial Dipole Outdoor Antenna is a cost-effective solution for challenging applications with increased reliability and fewer points of failure. 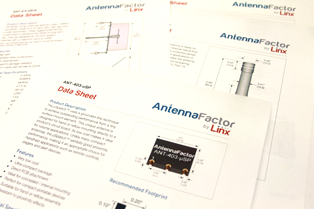 The first design ready for use is a ½-wave center-fed antenna operating at 2.4 GHz. The plastic and cable are rated for a wide temperature range and UV exposure for long-term reliability. Examples of industrial and outdoor applications include outdoor meters, solar panel controls and other sensor monitoring and control systems requiring a low-cost - but rugged - solution. 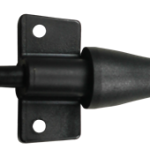 The Industrial Dipole Outdoor Antenna has a bracket molded into the assembly, which allows for the product to withstand stresses that may occur during installation or operation in an indoor or outdoor environment. This feature also makes this part of the antenna assembly IP67 rated. The material used in both the antenna structure and the cable itself have a wide temperature range of -40°C to +80°C with a UV resistance that meets UL 2556 section 4.2.8.5. Thanks to the advanced design of the integral bracket, we can offer this design at very competitive prices, far lower than other standard industrial antennas in the field. In addition, custom cable lengths are available upon request. *The IP rating applies to the antenna body only. IP ratings on the product’s enclosure depend on how the mating connector is implemented.